2 / 2 — One of the many custom built utility panels for clean room use. The ability to manufacture these custom units in-house greatly facilitated the ability to integrate many customer driven changes on short notice. Catalent Pharma Solutions is a global pharmaceutical manufacturing company that does trial tests for many of the largest pharmaceutical companies in the world. Catalent had a need to expand their production lines and allow for future growth, so they initiated a 22,000 square foot addition that will increase manufacturing, office, and laboratory space. 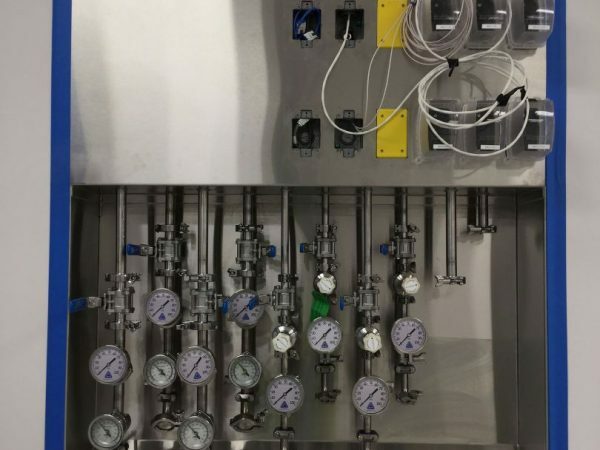 The Process Piping Department fabricated and installed custom stainless steel utility panels with integrated electrical and controls devices, each outfitted with specialty gases and thermal fluids, and installed a high purity water system. The Plumbing Department completed the building plumbing and underground process drain installation, including a new 5,000 gallon holding tank to facilitate hazardous room fire protection coverage. General Heating and Air Conditioning (GHAC) added a new 200 ton chiller to two existing chillers in order to support all the additional equipment that will need chilled water connections. Crews also added air handling units to the large new mechanical room in the addition. New pumps will be added to help expand the chilled water and hot water systems already in place, and new exhaust fans will serve the new production spaces and warehouse. The existing plant was open continuously throughout the project, and cleanliness was of the highest priority. Any disruption to manufacturing would be catastrophic to the clinical trials taking place. Extra precautions were taken including designated entry and exit zones, workers escorted through certain areas of the building, and temporary walls built through existing corridors to separate construction zones and working areas. GHAC installed high efficiency particulate air (HEPA) filtration in the temp walls to ensure the cleanliness of the working areas met expectations. For certain parts of the project, workers were required to complete Catalent’s “scrub in” procedure, and nothing was brought into the area or discarded without going through designated airlocks. 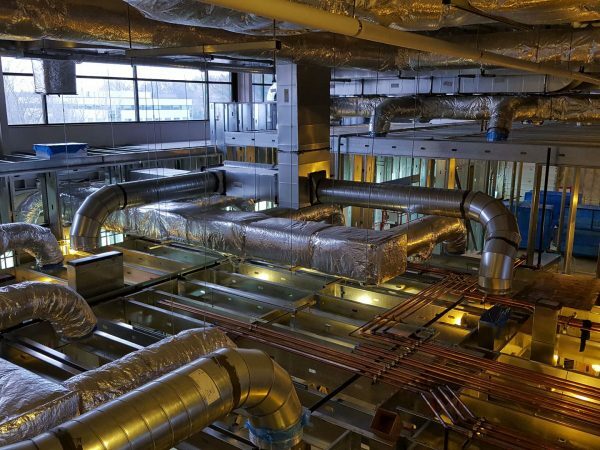 Crews tied in all of the steam, hot water, and chilled water piping into the existing systems in place on site, so coordination was a large priority. All tie-ins were done overnight or on the weekends to minimize disruption to manufacturing.